This month, interact with dinosaurs at an augmented reality experience, wear your pajamas to an all-you-can-eat-cereal cartoon party and pick up a designer chocolate Easter egg from a local chocolate shop. 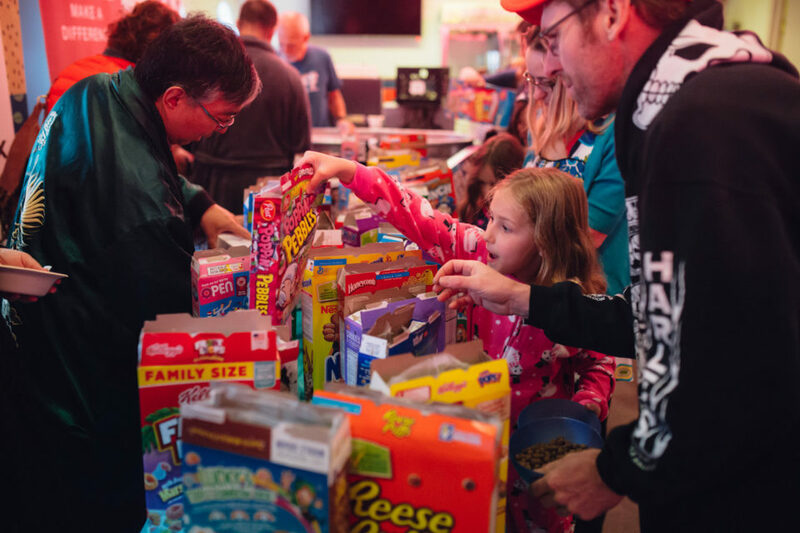 Last year's all-you-can-eat-cereal cartoon party at the Calgary Underground Film Festival. Photograph courtesy of the Calgary Underground Film Festival. Dinosaurs, giraffes, polar bears, whales — no, this isn’t a list of animals at the zoo or from a movie. Instead, these are just some of the animals you can digitally interact with at The Core this month. The downtown shopping centre is setting up an augmented reality experience on its second level glass bridge that displays guests and AR animals on a screen and lets them interact. Check it out on your next shopping trip or make a special visit just to try it. Nosh on all-you-can-eat wings to support KidSport Calgary? You don’t have to ask us twice. Bring your appetite to Cowboys’ 2019 Wing Off event, where you can try more than 25 wing flavours (and eat as much of them as you want) before voting on your favourites. This month, take some time to look through your bookshelves and make a donation to the Reset Society of Calgary’s book drive and sale, which helps women and children affected by trafficking and sexual exploitation. The annual fundraiser will be collecting books from April 5 to 24, then holding its sale from May 1 to 5 at Crossroads Market. This month, put on your running shoes and take part in Light It Up Calgary on April 6. Starting at 8 p.m., participants can take part in a three km walk, a five km walk/run or a 10 km run with the help of a headlamp. The nighttime walk/run supports Wellspring Calgary. Theatre Calgary closes its 2018-19 season with the Tony Award-winning production Billy Elliot: the Musical. The production, which tells the story of an English boy who longs to be a ballet dancer, will feature choreography by Yukichi Hattori, who danced with Alberta Ballet for 10 years. Come for the dancing, Elton John’s music and the inspiring story. 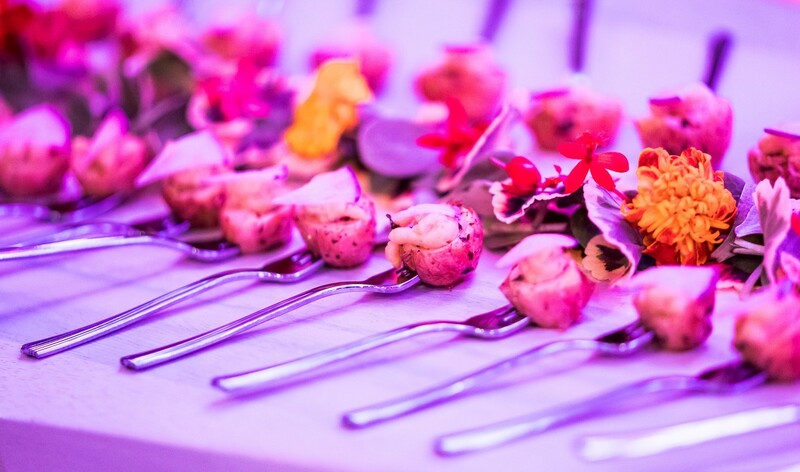 One of the dishes served at last year’s Planted kick-off. Photograph courtesy of WinSport. Whether you’re a dedicated vegan/vegetarian or simply trying to eat more plant-based fare, you won’t want to miss the return of Planted. Now in its second year, the vegan and vegetarian dinner series features several dining experiences over the next month, from a vegan brunch at Donna Mac to a finale tasting night at the Calgary Zoo. The best part? The series supports the Community Kitchen Program of Calgary. Once a month, Fort Calgary celebrates black and white films in all their glory with a black and white movie night in its own theatre. This month features director Alfred Hitchcock’s 1960 film Psycho, while the 1933 film King Kong will be screened next month on May 10. Make sure to order a drink or snack as well. 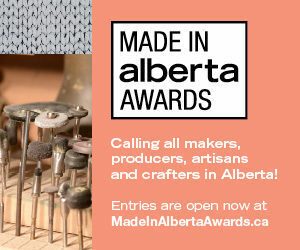 Avenue magazine recently launched the Made in Alberta Awards, which recognize and celebrate locally made products from across the province. The awards categories include food, drink, furnishings and home decor, fashion and accessories, games and leisure, beauty and crafts. Enter before April 30, 2019. Curious about what Bragg Creek’s food scene has to offer? April 12 is the perfect time to find out with the return of Taste of Bragg Creek. Held at the Bragg Creek Community Centre, the event features more than 25 food and drink vendors offering up tasty samples in exchange for some $1.50 tasting tickets. Calgary’s annual poutine extravaganza is back with a new name. During Poutine With Purpose, participating restaurants offer unique and classic takes on the popular dish. More than 70 restaurants are participating this year, including Cleaver, Wurst, Modern Steak, Burwood Distillery, OEB and more. Poutine Week is also an opportunity to contribute to a great cause through your stomach – each time a participating restaurant sells its poutine dish, Mealshare matches that by giving someone in need a free meal. The Chocolate Lab is once again taking chocolate Easter eggs to the next level. The local chocolate shop’s popular chocolate eggs are filled with treats and feature hand painted designs of everything from flowers to pop culture references. Swing by the Chinatown shop to pick one up this month. Curious about how the legal system works in Canada? The annual Law Day, which marks the month that the Charter of Rights and Freedoms was signed in 1982, is the perfect time to get more information. The free, family-friendly event will feature tours of courtrooms and the Alberta Law libraries, mock trials with pop culture characters, exhibitors and more. You can even take care of some business by getting a document notarized or getting a 20-minute legal consultation for free. You know Marie Kondo and her KonMari Method for tidying from her book The Life-Changing Magic of Tidying Up and Netflix’s show Tidying Up With Marie Kondo, but did you know that Calgary has its own KonMari expert? Helen Youn is the only certified KonMari consultant in Alberta, Saskatchewan and Manitoba, and she’s sharing tips for organizing your closet (and your home in general) at an upcoming workshop. Learn more about the KonMari Method and ask questions about decluttering your space. Did you know Calgary is home to the biggest model train show in the country? Whether you’re a hobbyist or just curious about model railroading, you can learn more about it at the Supertrain event this month. Check out tons of railroad layouts in person, meet exhibitors or go to one of the short clinics covering everything from scales and gauge to how to create realistic scenery. Butterfield Acres officially re-opens for spring and summer on April 1, and once again, the local farm is kicking the season off with its Legendary Easter Hunt. The family-friendly event features Easter egg hunts, farmyard animal visits, pony and tractor rides, planting in pots and more. Looking for a new read? Swing by the newly opened The Next Page in Inglewood to find your new favourite page-turner. Pages Books on Kensington‘s new sister bookstore carries everything from biographies to mysteries, so there’s something for everyone on those floor-to-ceiling bookshelves. A new addition to the Willow Park neighbourhood, the recently opened Southland Yard restaurant is your new dining destination for flatbreads, Wagyu beef hot dogs, PEI mussels and small plates like chili-honey almonds and coriander roasted carrots. But what’s particularly cool about Southland Yard is that there’s lots to do besides just eating — the restaurant has an indoor bocce ball court, shuffleboard, pool and foosball, not to mention board and arcade games. Monty Navarro wants to be the Earl of Highhurst, but there are a few small problems: there are eight other people ahead of him in the line of succession. Deciding that murder is his best option, Monty sets out to claim his family title by any means necessary, all while dealing with being at the centre of a love triangle. Catch a performance of the Tony Award-winning production A Gentleman’s Guide to Love & Murder at Stage West Theatre restaurants from April 19 to June 23. If you love cheese, this is one party you won’t want to miss. On April 20, Marda Loop’s Springbank Cheese Co. is holding a cheese cart party, an experience they liken to “cheese dim sum” and “a cheese buffet.” For $18, you can sample dozens of cheeses and snacks like charcuterie. Beer and wine will also be available for purchase. Fans of sci-fi, comics, pop culture and animation will feel right at home at this annual convention. Over the course of the Calgary Comic & Entertainment Expo, you can don your best cosplay to march in the downtown POW! Parade of Wonders, watch a combat demonstration, shop for comics and memorabilia from hundreds of vendors and visit Artist Alley. This is also your chance to see (and maybe meet) special celebrity guests including Back to the Future‘s Michael J Fox, Wonder Woman‘s Lynda Carter, Ian Somerhalder of The Vampire Diaries, Riverdale‘s Camila Mendes and more. This month, the Calgary Underground Film Festival returns for a 16th year and it’s bringing back its popular all-you-can-eat-cereal cartoon party on April 27. Wear your pajamas down to Globe Cinema to munch on sugary cereal while watching retro cartoons the whole Saturday morning. Be sure to check out some of the other CUFF events and activities as well, including more than 50 feature films and shorts, free arcade games, a free movie screening on National Canadian Film Day and more. CUFF runs from April 22 to 28. A surefire sign that it’s spring? The return of alfresco dining and food trucks. More than 16 local food trucks will descend upon East Village’s C-Square area during the Spring Frenzy event hosted by YYC Food Trucks. Grab some tasty eats, listen to live music and enjoy the (hopefully) warm spring weather from 11 a.m. to 7 p.m. on both days. Now that it’s spring, many local arts and crafts markets are getting back into the swing of things. Whether you’re looking for locally made greeting cards, apparel or home decor, there are tons of places to get them in the next few months. Make It Calgary from April 5 to 9, the Curated Spring Market from April 12 to 13 and The Fibre Shindig on April 13 are just a few of the markets you can check out in April. It’s been 50 years since American astronauts Neil Armstrong and Buzz Aldrin landed on the moon — the first time this feat had ever been achieved. To mark the milestone of this extraordinary accomplishment, Canadian astronaut Chris Hadfield will be speaking on the topic of space exploration at the Jack Singer Concert Hall on April 29. Don’t miss the chance to hear one of Canada’s national treasures live.